The Cincinnati Enquirer Top Workplaces seeks to determine the top workplaces through employee surveys. Companies must be nominated to participate in the award. 1,100 companies were nominated and 125 companies met the score high enough to earn a Top Workplace designation. Scores are measured through a 24 question employee survey and must have a 35% or higher response rate from employees. Companies are divided among “Large”, “Medium” and “Small” award winners based on employee size. Barron’s Top 100 Independent Financial Advisors ranking is determined by a rigorous assessment process, with firms from all 50 states and the District of Columbia undergoing examination. The volume of assets overseen by advisors and their teams, revenues generated for the firms, and the quality of advisors’ practices – including investment philosophy, business practices, and contributions to the community – are all evaluated. Investment returns are not a component of the rankings, as returns are largely dictated by the risk tolerance and goals of clients. 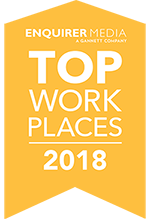 The Cincinnati Business Courier ranks “best places to work” by administering employee surveys through a third party, Quantum Workplace. Companies are rated by their employees in areas such as senior leadership, team effectiveness, work recognition and benefits. Quantum then scores the companies and ranks the “best places to work” in five size categories as determined by employee size. The 2018 Financial Times Top 300 Registered Investment Advisers is an independent listing produced by the Financial Times. The FT 300 is based on data gathered from Firms, assets under management (“AUM”), AUM growth rate, years in existence, compliance record, industry certification (CFP, CFA etc…) and online accessibility. Around 2,000 Firms are invited to participate. Neither firms nor their employees pay a fee to The Financial Times in exchange for inclusion in the FT 300. Third-party rankings and recognition from publications are no guarantee of future investment success. Working with a highly rated advisor does not ensure that a client or prospective client will experience a higher level of performance or results. Generally, ratings, rankings and recognition are based on information prepared and submitted by the advisor and not all investment advisors participate in the process. A more thorough disclosure of the criteria used in making these rankings is available through each publication.